"Horror has returned to Haddonfield." Halloween; the night HE came home! These words were never so true as when they applied to the long awaited release of Halloween 4: The Return of Michael Myers. 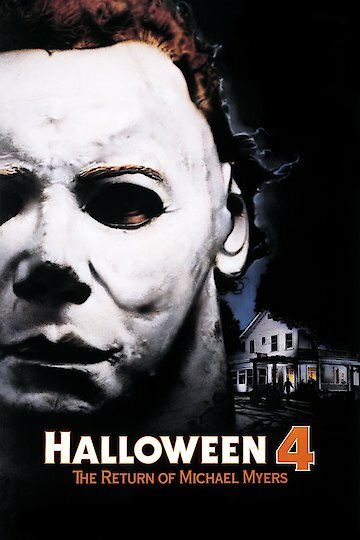 Due to a skip of movie plots of the franchise, Halloween 4: The Return of Michael Myers picks up years after its predecessor; Halloween II, which left audiences questioning whether they had seen the last of Michael’s pasty, white face. Halloween 4: The Return of Michael Myers answers these questions and leaves room for more to be asked. The movie opens with a medical transport crew prepping Michael to be moved to another facility. Having been comatose for several years after the explosion and fire that was set by his doctor, Sam Loomis, it has been decided to transfer Michael to a less secure facility because of his condition. Just as before, no one believes Dr. Loomis’ observations or predictions that Michael is simply waiting for the right time to return to Haddonfield. The main reason for this disbelief is because Laurie Strode, Michael’s sister and narrowly escaped victim, died in a car accident with her husband. While this may seem as if it should be the end of the story it is merely the beginning because Laurie is survived by her daughter; Jamie, who is living with a foster family. The little girl is only all too aware of her relationship to Michael Myers and fears that he will come looking for her just as he did her mother. The most frustrating part is that everyone thinks the little girl is just paranoid over her mother’s past trauma; everyone except Dr. Loomis. Although everyone thinks Jamie is just paranoid when Dr. Loomis arrives everyone takes thinks a lot more seriously; especially the new sheriff who was present for Michael’s last visit home. Dr. Loomis and Sheriff Meeker quickly locate Jamie and her foster sister, Rachel in the hopes of keeping the girls safe. Believing his house offers the utmost safety for the girls the sheriff takes them there in the hopes of protecting them by locking everyone out. Unfortunately, the girls end up locked into the house with Michael and begin their fight for survival. The movie loses none of the element of suspense and fear that its predecessors inspired, nor any of its elements of surprise. Halloween 4: The Return of Michael Myers is currently available to watch and stream, download, buy on demand at Amazon Prime, Shudder, Vudu, iTunes online.